Hanoi (VNA) – President Tran Dai Quang has asked artists and writers to show stronger performance in implementing the Party and State’s orientations in building literature and art in the new period as well as developing the culture and people of Vietnam to suit the requirements of the country’s sustainable development. 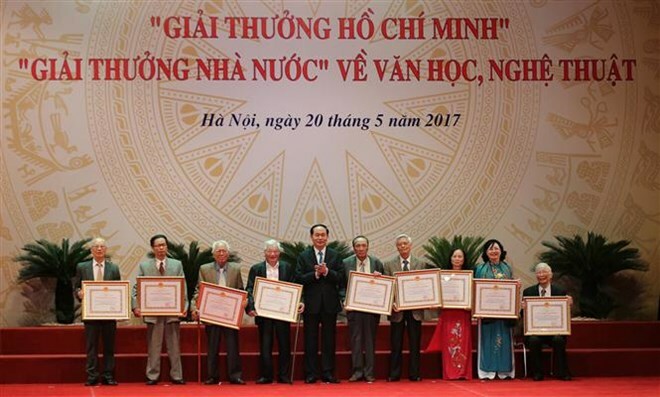 The President made the request while addressing a ceremony in Hanoi on May 20 to honour 18 authors winning the 2017 Ho Chi Minh Award and 95 others with the State Award on literature and arts, the two noble awards for outstanding authors. The State leader noted that the literature and art of Vietnam have inherited and promoted the patriotism and humanism of the nation, while closely attaching to the revolutionary career of the Party and nation. They are a sharp tool in the cultural and ideological battlefield, significantly contributing to the victory of the struggle for national liberation, reunification as well as construction and defence, he said. He recognised the creativity and devotion of generations of artists and writers in improving the country’s revolutionary literature and art, and bringing glory to the nation. He highlighted the outstanding artistic and ideological values of works honoured at the ceremony, which he held that will make great and long-term influences to society and contributing to the development of the country’s literature and art. He asked literature and art associations to focus on reforming their operation to create favourable conditions for artists and authors to engage deeply to the society to make more valuable works with high value, meeting the increasing cultural demand of people. The associations should encourage new progressive factors and denounce the bad that hinders the growth of the country and people of Vietnam, he said, urging the association to promote community art and focus on boosting the growth of the professional art by expanding international cooperation and learn humanitarian values of friends around the world. On the occasion, he also requested the Ministry of Culture, Sport and Tourism to continue paying due attention to encourage artists and writers to promote their talent and creativity, while popularising the country’s art and literature with high awareness of their social responsibility and citizen’s obligations. He also asked the ministry to work more closely with relevant ministries and agencies to propose the presenting of the Ho Chi Minh Award and State Award on Literature and Arts to those who deserve them.